If you’ve visited an Albertsons or Safeway in the past month, you know they’ve kickstarted their Monopoly sweepstakes game for the year. After the game was released on February 9, it has already gotten the attention of millions with its $1 million grand prizes. Additionally, you no longer have to collect physical game pieces. 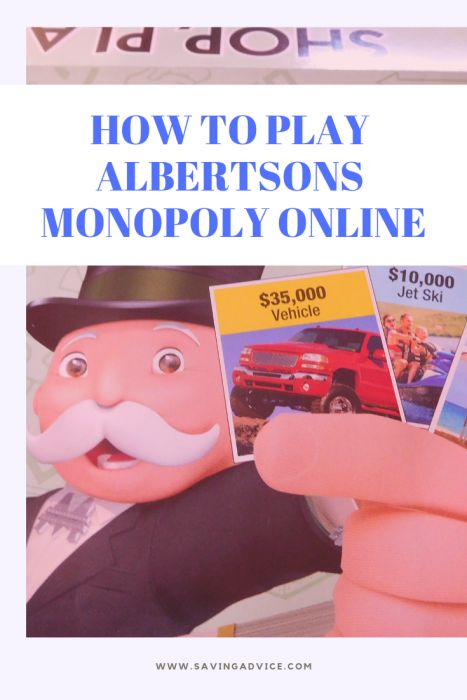 Now, you can play Albertsons Monopoly online! That’s right! The contest, which has been highly-anticipated each of its nine years, can appeal to even the most tech-savvy amongst us. All you have to do is go shopping at an Albertsons-owned store for your groceries (groceries that you’ll buy anyway). Then, you collect the game pieces and you can play online. To play online, you simply fill out a submission form. You enter information like your name, email address, address, phone number, etc. When you get a Monopoly game piece, you enter the online code into your “play monopoly” account and begin collecting your game pieces. You have to get matching game pieces to win or two of the “rare” game pieces. Prizes include two $1 million prizes, four million-dollar vacation homes, and the total pool of smaller prizes are worth more than $200 million. Of course, eight years ago (when it first started), Albertsons had far fewer stores and far fewer Monopoly game pieces being distributed. No one pays to play Albertsons Monopoly which is an added bonus. From now until May 7, you will have the option of collecting the pieces when you go shopping. Practically 2,300 stores across the United States will be offering game pieces to its customers. In addition to the larger names, a number of small local stores are offering games pieces for shopping as well. Participating stores include Albertsons®, Safeway®, Pavilions®, Carrs®, Vons®, Randalls®, Eagle®, Pak ‘n Save®, Tom Thumb®, ACME Markets®, Jewel-Osco®, Shaw’s Supermarkets®, Star Markets®, United Supermarkets®, Market Street®, Amigos®, United Express®, Albertsons Market®, Lucky® (Southern California only) and Super Saver® stores (“Market Stores”). You can also enter through the United States Postal Service by sending a self-addressed envelope to the Albertsons Monopoly at MONOPOLY MON-09 Collect and Win Game Ticket Request, Attn: Promotions Coordinator, P.O. Box 965068, Marietta, GA 30066. These should be handwritten addresses on the envelope and they can also be postmarked no earlier than February 9 and they must also be received before the contest is over (May 7). However, most people will be playing online and entering to win some really great prizes, including the $1 million grand prizes. Some previous winners have traded Monopoly pieces in order to win big. Be sure to check out the Albertsons Monopoly game piece thread in the Saving Advice forums! 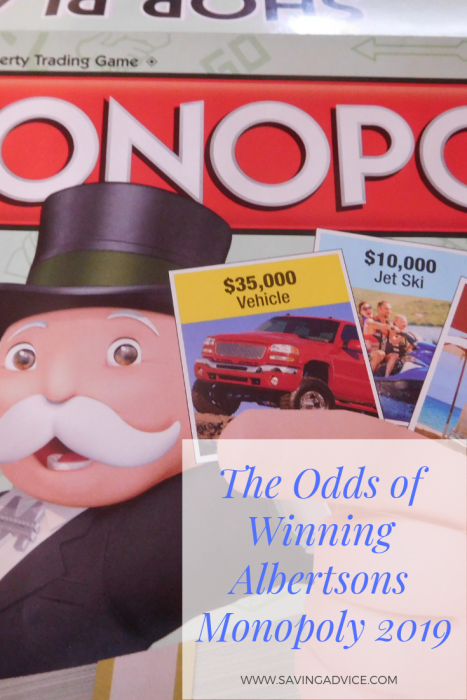 If you’re familiar with the Albertsons’ Monopoly promotion, then you know it’s no secret that your chances of winning the jackpot prize are extremely difficult. This year, the big cash prize is $1,000,000 once again. But, don’t get your hopes up; the odds of winning aren’t great. In order to win one of the bigger rewards, such as the vacation home, luxury car or home makeover, you need to find rare and semi-rare pieces. These change every year, and with the competition just starting last week, it may take some time before all the rare pieces are revealed. Get creative. Leave no stone unturned when searching for these items or leads. Many blogs share the full list of items as well as continuously update as the promotion continues. We suspect you will be able to find more of these by the end of February or beginning of March all over the internet. People seem to really ban together for this event as it is knowingly challenging to fill your game board. Some online forums we found were on YouTube.com with a search for Albertsons Monopoly. Get out of the area. You probably will not have much luck if you only shop in the participating stores in your area. If you are really dedicated to winning this year, you are going to need to shovel out some gas money and consider taking a road trip or two (both long and short) to increase your chances of finding these rare game pieces. As a reminder of the game rules, you can even make a small purchase in order to receive a ticket, but there are exceptions such as no tickets provided with purchases of tobacco products and lottery tickets. Start early. The sooner you start, the better as you will believe to collect more over time. However, expect to see a large distribution of tickets in April since the contest ends May 7. You may be able to lock in some last-minute prizes at this time and having some decent tickets to trade will help your chances. Share the wealth. There are participants who are willing to buy, trade and sell tickets they need for this Albertsons’ Monopoly promotion. Individuals will sell on eBay as well as trading sites like this one. Of course, the rare pieces will be a bit costly as the seller may be potentially helping you win $1,000,000. You, too, can cash in, though, by selling tickets you don’t need or even trading groups of tickets with other competitors in order to fill in a color on the board. Be careful. Be quite cautious when you are hunting for areas to buy and sell these rare game pieces. The world is full of scammers, and the internet is no exception. Do your research, review the seller and make sure you are submitting your credit card numbers through a safe and secure site. What Are The Rare Game Pieces in 2019? Additionally, there are a number of instant win opportunities and small prizes available as well. The odds of winning an instant cash prize of $10,000 are still pretty low at 404,000,000:1. However, the smaller the prize, the more likely you are to win. These odds are based on finding the rare game piece. Many people have been able to win in the past by trading these game pieces online. Visit the Saving Advice forums Albertsons Monopoly trading thread. Albertsons Monopoly kicked off at the beginning of the month. Many shoppers have begun collecting game pieces as they do their regular grocery shopping. If you’re looking for a way to earn even more chances to win, you can get Albertsons Monopoly game pieces for free without spending a dime! To win, you will need a large number of tickets. Thankfully, there are more than 2,000 locations giving out Monopoly pieces. In addition to the larger names (Albertsons and Safeway), other Albertsons-owned retailers are participating as well. Qualifying purchases at Pavilions, Carrs, Vons, Randalls, Eagle, Pak ‘n Save, Tom Thumb, Jewel-Osco, Acme Markets, Shaw’s/Star Market, United Supermarkets, Market Street, Amigos, United Express, Lucky (Southern California only) and Super Saver will get you closer to winning the 2019 game. With that in mind, here are the three ways to get free Safeway and Albertsons Monopoly game pieces. Even though the price of stamps has increased, envelopes and postage are still cheaper than a cart full of groceries. This is the most straightforward way to get free Albertsons Monopoly tickets. The official rules for Safeway and Albertsons Monopoly still state that you can include a SASE in an old-fashioned postal letter to MONOPOLY MON-11 Collect and Win Game Ticket Request, Attn: Promotions Coordinator, P.O. Box 965068, Marietta, GA 30066. The mail-in requests must be received no later than May 9, the last date tickets will be distributed for the promotion. It must be mailed in individually and legibly addressed. Any submissions made in business reply envelopes will not be considered. Other restrictions do apply, so you’ll want to read the complete rules in order not to miss anything. Once you send in your request, you will receive one game ticket and one bonus game ticket, for a total of two tickets. It’s also important to note that the online prizes are different than the Collect and Win portion of the game. 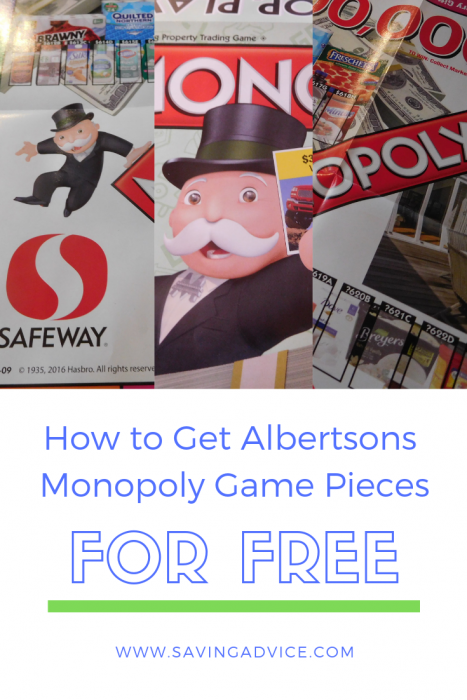 Another strategy for getting Albertsons Monopoly game pieces for free is trading them online. Some sites (like Craigslist) will have posts detailing individuals wanting to swap unneeded game pieces. You can also trade Monopoly game pieces in the Saving Advice forums. If you’re not having any luck with trading, consider searching for the specific grocery brands included in the promotional deal. You could even post an ad and explain that you want to pool Monopoly game pieces with people who’ve shopped at all the different grocery brands that participate in the promotion. Sometimes, you may even find someone willing to give their tickets away entirely. Any of your friends who shop at any of the participating grocery stores may be able to help you win too. If you pool your tickets, you may be able to improve your odds of winning. The wider the circle of friends you reach out to, the greater your chances of obtaining multiples of the same ticket. The more people you’re able to get involved, the better your chances are. This, in addition, to the other two strategies mentioned above, your chances begin to add up. Given the odds of winning Safeway and Albertsons Monopoly, any way you can obtain game pieces will put you ahead. So if you’re willing to do the extra work, you can play smarter without ruining your budget. Readers, are you playing the Albertsons Monopoly game this year? Albertsons Monopoly is back! The Collect and Win game pieces are probably already cluttering up your car and maybe even your kitchen counter. While the basic game pieces are easy to come across, the rare and semi-rare pieces can be a little tricky to find. Luckily, after 11 years of playing the sweepstakes game, people have come up with tricks to win Albertsons Monopoly. This is the eleventh year Albertsons stores have offered shoppers a chance to win $1 million through its Monopoly sweepstakes game. Over the years, shoppers have found inventive ways to win the game. Here are just a few tricks you can keep up your sleeve. Team up with friends and family. Gather a large group of loved ones to divide and conquer. The more tickets you can collect and trade, the better your chances can be at finding those rare pieces and, ultimately, winning at least one of the bigger prizes. Essentially, this is a collect-and-win game. See if your family is interested in participating this year together. Plus, this can be a great family-bonding experience. Sharing is caring after all, right? Peruse around on Cragislist.com and online forums. Craigslist is already starting to fill with individuals holding a handful of extra tickets they are willing to trade so that they can fill their own game boards. Other outlets like the comment sections on YouTube.com Albertsons’ Monopoly videos also contain useful information from participants with markers to trade. You can always use competitions from the past to implement to the 2018 game. While you likely will never find a rare or semi-rare piece for free, you can at least still cash in on some of the other useful and fun prizes. Not to mention those bonus tickets can really come in handy too. Follow this pair of traveling sisters’ advice. These sisters previously posted their winnings on Youtube.com after doing a mini-road trip to a variety of Albertsons stores in the southwest. You can read more about their journey and their strategy on their site. However, despite collecting thousands of tickets, they still did not hit the big prize. This will hopefully give you an idea of how many tickets you need to gain in order to increase your own chances. Only buy your groceries from Albertsons and Albertsons-owned participating stores until May 8. Again, the more markers you gather the better your odds. So, by doing your regular grocery shopping at these chains, you can get an early start on collecting. Plus, you can mail-in requests for tickets as well. In summary, you should do your research, start early and recruit a crew to tackle this promotion. Keep your eyes and ears peeled for how to obtain those bonus tokens as they often lead to more winning opportunities. Hopefully, these tricks to win Albertsons Monopoly will you help you with your efforts in 2018. Are you playing Albertsons Monopoly this year? What tips do you have to offer? What has worked for you in the past? Safely trade your Albertsons Monopoly games pieces in the Saving Advice forums! Attention, shoppers: It’s not impossible to win the Albertsons Monopoly game in 2019, though the odds are against you. However, there were a number of high-dollar winners in 2018. A few of them gave their tips on how to win the Albertsons Monopoly game this year. As you may know, Albertsons is under an umbrella of a number of retail stores such as Safeway, Jewel Osco, and others. Each of these stores is offering game pieces to customers. And, in 2018, they also gave those customers HUGE prizes. Here is a list of big-ticket winners from 2018 and where they got their winning pieces. The following winners collected their winning ticket from ACME stores. Each of the winners below scored their big prize shopping at Albertsons stores. It should also be noted that the $1 million jackpot was collected at an Albertsons last year as well. The Albertsons was located in Eastern Idaho. Albertsons Market shoppers were able to get lucky in 2018 as well. Here’s what their customers raked in during the game last year. The following individuals won Albertsons Monopoly by shopping at Jewel-Osco last year. Market Street shoppers weren’t left out of the fun either. However, no $40,000 prizes were given out to these customers. Pavilions is yet another store you can pick up Monopoly game pieces. Here are last year’s winners. Another Safeway brand, Randalls, had a number of small-dollar winners last year. Safeway is the second largest store to offer the Monopoly game (other than Albertsons). Unsurprisingly, its shoppers were some of the biggest winners. Shaw’s had a number of high-dollar winners as well. Tom Thumb, another Safeway company, also had a number of winners in 2018. You can also collect Monopoly pieces at United stores, where there were a few winners in 2018 as well. Outside of the $1 million GRAND PRIZE given away at Albertsons last year, Vons gave away another huge prize. Karen T. from California won a $100,000 cash prize (or luxury vehicle). The store also awarded the following prizes last year. The story of a previous year’s Grand Prize winner provides further insights on how people are able to win the game. In 2012, an El Paso Community College student named Melissa Varela swooped up the $1 million cash prize of the “Collect and Win” game by shopping at the 9111 Dyer Albertsons Market in El Paso. At the time, she was the only million-dollar winner since the contest began in 2009. Prior to Valera, the last grand prize was awarded in the promotion’s first year to a Los Lunas, NM couple who won a $500,000 mortgage payoff. Varela increased her chances by accepting tickets and increasing the number of times she shopped each week. She may have only shopped at one Albertsons location, but others have seen much success in the form of free grocery goodies by shopping at multiple sites. The moral of the story: If you’ve made the decision to play the 2019 Albertsons Monopoly game, you need to commit big. Making regular visits to the participating stores and collecting as many tickets as possible seems to be the best bet; at least, that is what worked for Melissa. Luck definitely plays a role but so does consistency. Also, don’t forget you can also submit for a second-chance drawing. Winners have been able to collect the grand prize through the second-chance drawing by submitting their game pieces online. Don’t forget to register for your free game pieces too! 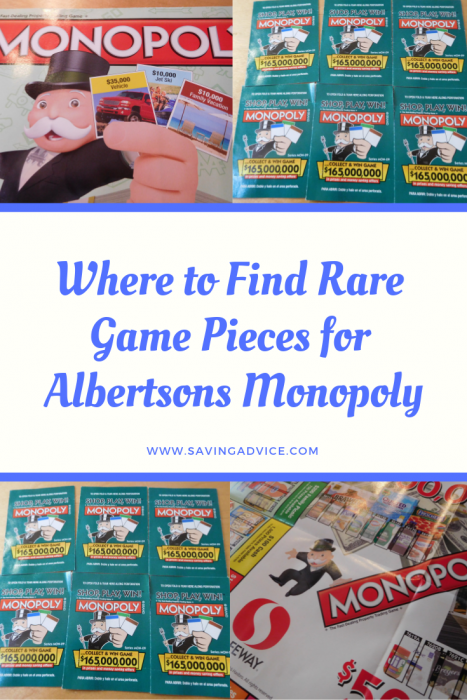 Readers, if you’re looking for a place to safely trade Albertsons Monopoly pieces, head on over to the Saving Advice forums! Albertsons Monopoly is back for its 11th year. 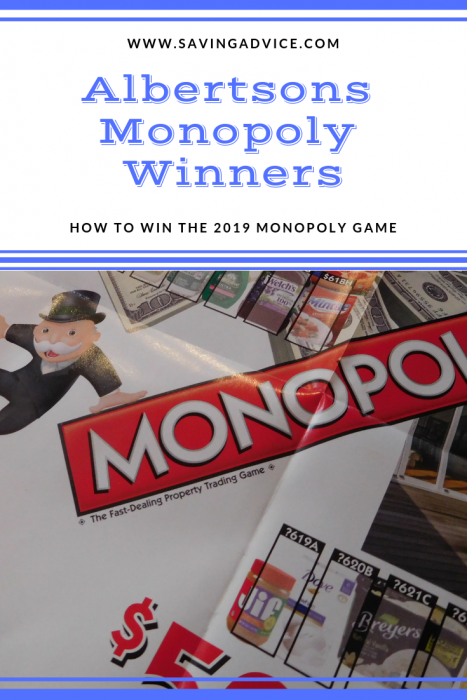 The contest, which involves collecting Monopoly game pieces from various Albertsons-owned stores, has been something that has created a bit of a stir in recent years. You collect game pieces and, if you are lucky, you will get the right pieces and win the grand prize of $1 million. Until May 7, you will have the option to gain Monopoly game pieces when you shop at an Albertsons-owned store. 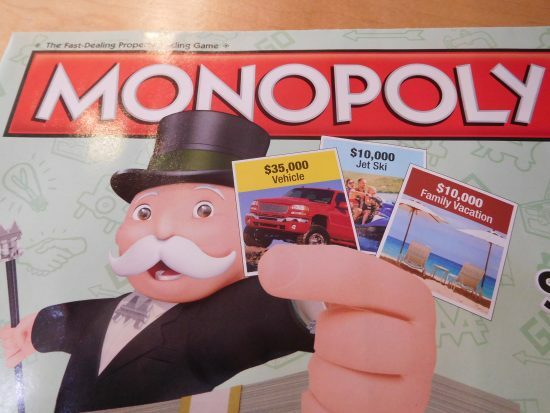 The overall goal of the game is to match a set of properties on a Monopoly game board to win a specific prize. Prizes range from free groceries or merchandise to $1 million. Practically 2,300 stores across the United States will be offering game pieces to its customers. This year is the first year Safeway shoppers will be eligible to play. ACME, United Supermarkets, Star Market, Safeway, Tom Thumb, Randalls, Pavilions, Vons, Jewel-Osco, Shaw’s, and several smaller, local stores are all offering the Monopoly game pieces and a chance to win $1 million to its customers. The contest in which people win millions of dollars has been a highly-anticipated event each year since it started 11 years ago. Since Albertsons is continually growing, the contest is continually growing as well. This year, the prizes are bigger as last year and the probability of winning is much higher than in previous years. Now that you’ve read a bit about the contest, you may be thinking about trying your hand at winning. What are the odds of winning Albertsons Monopoly and taking home one of the $1 million grand prizes? To win the grand prize of $1 million you need to find two of the hardest to find game pieces. Chances of finding one of these rare game pieces are now 1 in 404 million. So, that means (on the first try) your odds of getting both of the pieces necessary to win $1 million are more than two trillion to one, which aren’t greats odds. However, it isn’t impossible to win. Additionally, like last year, Albertsons is offering six prizes valued at $1 million. Of course, there are the three $1 million cash prizes but the grocer is also offering three $1 million vacation home prizes as well. If these prizes go unclaimed, Albertsons then performs a second chance drawing for a shopper to get their $1 million. As stated above, you’ll need to collect rare game pieces to win the grand prize. It isn’t very likely you’ll find one yourself. You are more likely to encounter “rare” games pieces through online trading. Some people trade game pieces to give themselves a better chance of winning one of the prizes (even if it is not the grand prize). It isn’t usually very hard to find someone willing to get rid of a “semi-rare” pieces that may complete a winning set for someone else. That is only to win the $1 million cash prize or vacation home though. If you are okay claiming a smaller cash price, there are plenty of other rewards to be had. However, there are fewer of these opportunities this year. There will only be 67 million tickets available for free grocery products with values between $0.59 and $14.99 (compared to 112 million tickets last year). 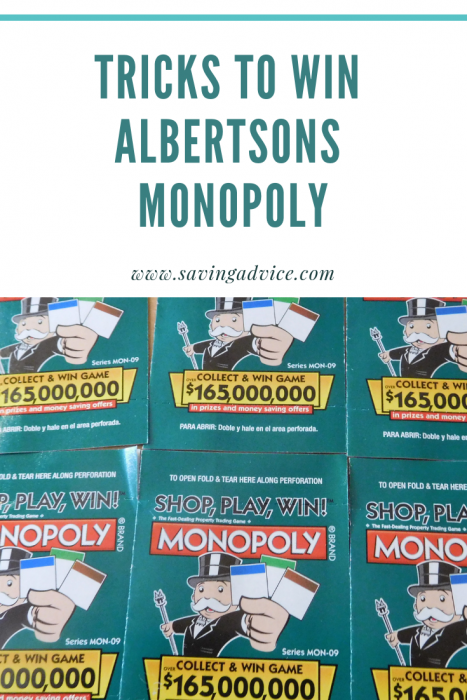 In all reality, if you win anything from the Albertsons Monopoly game, it will likely be one of their smaller prizes, like gift cards, free grocery items, and other small cash prizes. You don’t pay to play though, so you’ve really got nothing to lose. Aside from buying your regular groceries, Albertsons Monopoly costs absolutely nothing for those who play. From now until May 7, when you purchase your groceries at an Albertsons grocer, you will get game pieces. If you’re looking for a place to safely trade Albertsons Monopoly game pieces, head on over to the Saving Advice forums.